Le Colisée est l'une des attractions les plus visitées au monde, mais peu de gens s'aventurent au-delà de l'amphithéâtre principal. Bénéficiez d'un accès exclusif aux zones cachées de l'attraction inscrite à l'UNESCO, auparavant fermée au public. Découvrez des mécanismes anciens complexes au niveau souterrain et apprenez comment des gladiateurs et des bêtes sauvages ont été préparés pour le ring. 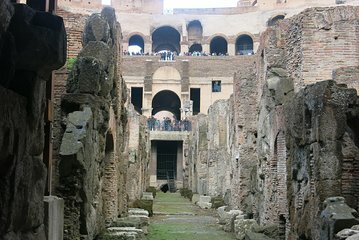 Les visites guidées comprennent un accès à la ligne coupe-file et un arrêt au Forum romain et à la colline du Palatin. Battez les foules avec un accès rapide au Colisée et au Forum Romain, qui vous fera gagner du temps. Niko was great! He had great knowledge of the history of the Colosseum and answered everyone's question with kindness. Very helpful! Got to see the underground of the colosseum and Niko explained everything while he guided us through it. Underground was amazing! This was a good tour but the rain changed our plans to see the underground area so, we missed that part of the tour. That wasn't really anyone fault. The forum, however, was excellent and amazing to walk the path of the city and hear the information the tour guide provided. Excellent tour. It rained heavily on the day we went to the Colosseum. Even though I saw zero flooding from above, security told everyone that the below area of the Colosseum was flooded and would not allow for anyone to go. I ended up paying all that extra money for the regular tour. This completely sucked and based upon the tour operator's guidelines, you pay no mater what, rain or shine. Other than that, the tour operator was good. The radios used to hear her were of very poor quality and I had to change my radio out twice during the tour. The Forum was awesome and I highly advise no one to miss this area of Rome. Our tour guide Alessio was great! He was very knowledgeable, passionate, and patient with our group. He share photos and stories and was very intelligent. Highly recommend this tour! It was a wonderful experience. Nick , our guide, was amazing and learned I would definitely recommend this tour to anyone traveling to Rome. Great tour, don't miss it! Really know the history and about every single part of the tour! Highly recommend!! Colosseum is unforgettable !!!!!!!! This was a fantastic 3-hour tour. Our tour guide, was extraordinary. Provided a great introduction to the Colosseum.. Our guide had a great sense of humor and the time on the tour just flew by. Colosseum and its undergrounds was GREAT!. IT WAS AN EXCELLENT EXPERIENCE I STRONGLY RECOMEND.!! !